What Does James Teach us About the Tongue? It should be evident through our human experience that what we say in passionate discourse, driven by our jealousies and self ambitions, is sinfully disordered. (James 3:13-18) We can say, scream, or spitefully whisper, things that should not be said. These things can destroy relationships, ruin opportunities, and discredit our witness. The enemy is the father of lies. When we allow our tongue to run unfettered it does the work of the devil. Let’s take a look at what God says about the tongue in the book of James. 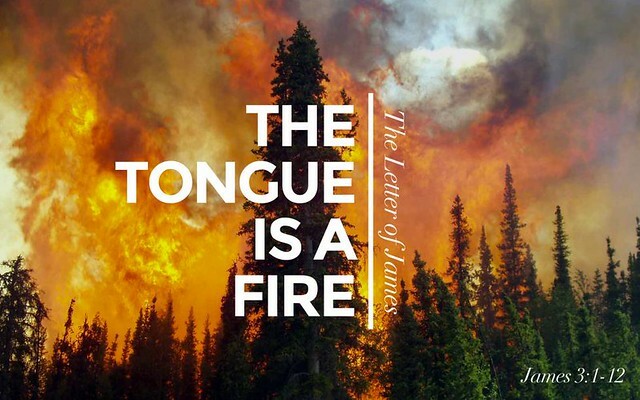 He says that it is, “tongue is a fire, the very world of iniquity” In this context, fire is destructive. It destroys and consumes everything it touches. It defiles the entire body. It sets the course of our life, and is set on fire by hell. Wow, and ouch! It sets the course for our life? Yep, by the sinful, undisciplined, words that come out of your heart and mouth, your entire life’s course is changed. Look at how many public figures careers have been ruined by something they said, or how many Evangelist who were caught by an open mic saying something unbecoming. It is set on fire by hell. That paints a very scary picture in my mind. It is a restless evil and full of deadly poison. How many times have you poisoned someone by saying words out of a selfish position? How much hurt have you caused to those you love by expressing your sinful heart’s passion recklessly? I know I am guilty of of it for sure. I look back and regret the hurt and injury I inflicted with my words. James quotes the psalmist when he says, “But He gives a greater grace. Therefore it says, “God is opposed to the proud, but gives grace to the humble.” (NASB) James 4:6 So what instruction can we receive from the scripture? Are we hopeless to control our tongues? The scriptures are clear that we can have our sinful natures changed by the work of God. Christ’s work justifies us, and the Holy Spirit brings us to new life. As the new man learns and grows, he can, and will have more success battling against the destructive self-centered overflow of the heart. This is due to the Holy Spirit’s work applying the truth of God and His word to our hearts. We have new hearts, with new desires and affections. As these begin to rule and dominate, we are conformed to the likeness of Christ our Savior. We begin to speak wisely, and gently. We aren’t perfect, but by God’s grace we are justified and sanctified. So also the tongue is a small part of the body, and yet it boasts of great things.